He's in terrific spirits. 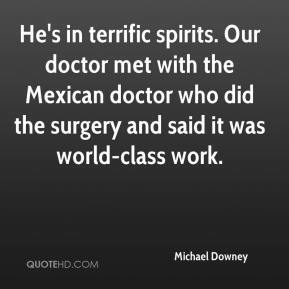 Our doctor met with the Mexican doctor who did the surgery and said it was world-class work. I've never met anyone who's a bigger fan of other people's success than him. 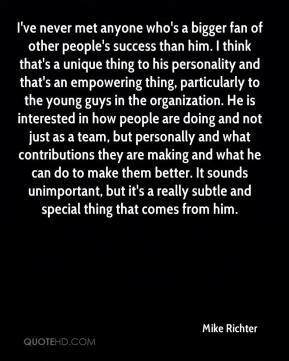 I think that's a unique thing to his personality and that's an empowering thing, particularly to the young guys in the organization. He is interested in how people are doing and not just as a team, but personally and what contributions they are making and what he can do to make them better. It sounds unimportant, but it's a really subtle and special thing that comes from him. Both met with us, and they would very much like to sit down with us about having the Presidents Cup in 2011. 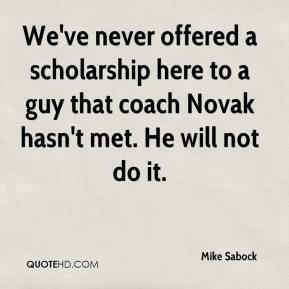 We've never offered a scholarship here to a guy that coach Novak hasn't met. He will not do it. 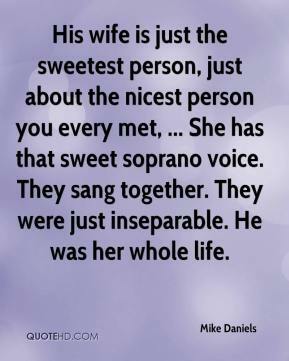 His wife is just the sweetest person, just about the nicest person you every met, ... She has that sweet soprano voice. They sang together. They were just inseparable. He was her whole life. 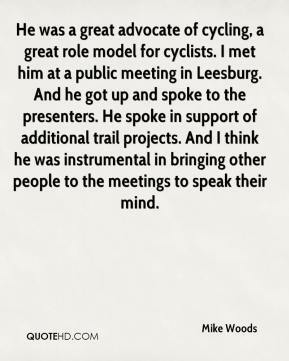 He was a great advocate of cycling, a great role model for cyclists. I met him at a public meeting in Leesburg. And he got up and spoke to the presenters. He spoke in support of additional trail projects. And I think he was instrumental in bringing other people to the meetings to speak their mind. I'm just an old safety guy, but I haven't met a Hispanic terrorist yet. If a guy's got a job and he's contributing by paying taxes, buying groceries and buying cars, I'd hate to see him kept from working. 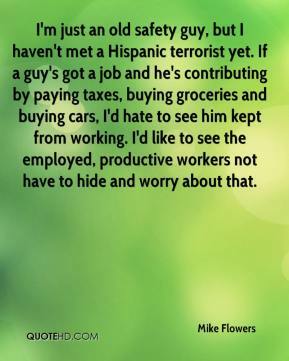 I'd like to see the employed, productive workers not have to hide and worry about that. I've really enjoyed it. I've never met so many friendly people ... and I knew that [fact] before I moved here, and that's why I wanted to move here. 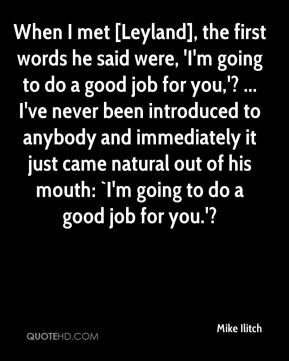 When I met [Leyland], the first words he said were, 'I'm going to do a good job for you,'? ... I've never been introduced to anybody and immediately it just came natural out of his mouth: `I'm going to do a good job for you.'? 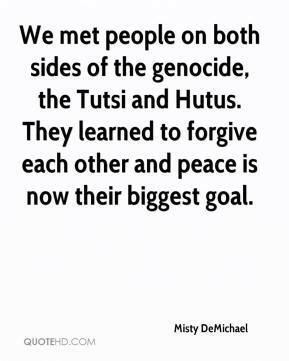 We met people on both sides of the genocide, the Tutsi and Hutus. They learned to forgive each other and peace is now their biggest goal. 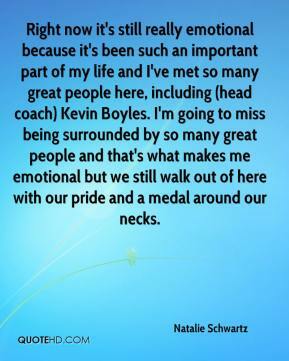 From the moment we walked in the room and met him we felt very comfortable with him. 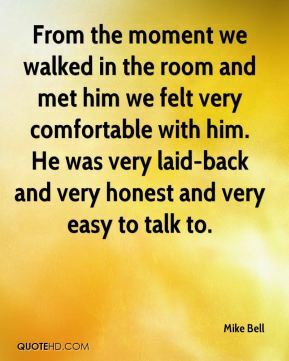 He was very laid-back and very honest and very easy to talk to. 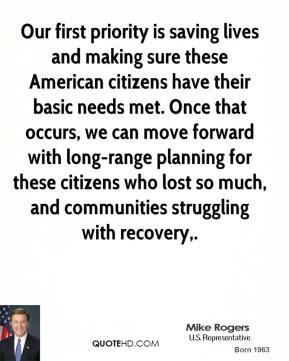 Our first priority is saving lives and making sure these American citizens have their basic needs met. Once that occurs, we can move forward with long-range planning for these citizens who lost so much, and communities struggling with recovery. 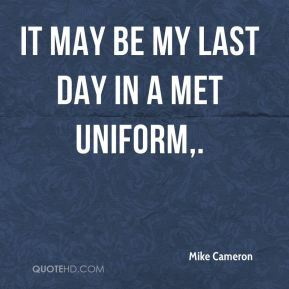 It may be my last day in a Met uniform. He's probably the most positive human being I've ever met. 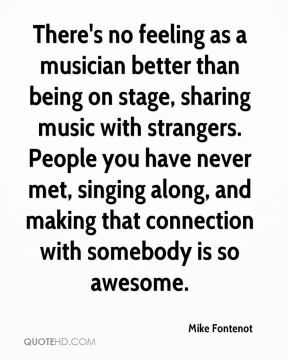 All the people we've met have been so wonderful. We've had volunteers come up to us and tell us how they were involved and say 'Hey, we worked on this part of your house.' And it's just all so humbling to know that these people did all that work for us . I was in tears all the time, it was so emotional. I've met him a couple times. We laughed about the name being similar. I've never had any business with him. 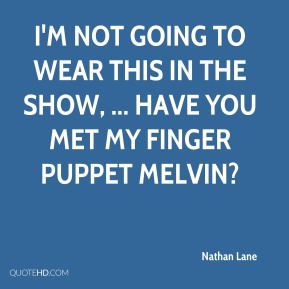 I have had no business with him and no business with Frances Deane. 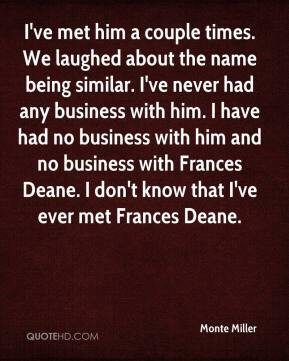 I don't know that I've ever met Frances Deane. 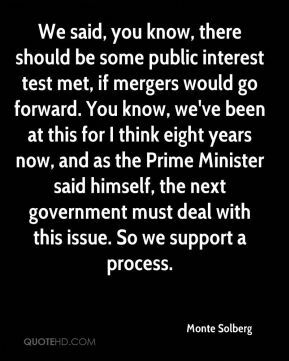 We said, you know, there should be some public interest test met, if mergers would go forward. You know, we've been at this for I think eight years now, and as the Prime Minister said himself, the next government must deal with this issue. So we support a process. Melia is absolutely lovely, and so is her family. She's one of the sweetest people I've met, and it's for all the right reasons that she and Eric are so happy together. You're talking about two players who met every expectation. In some ways, they were even better than I had thought they would be. Mike hit a lot better than he had in past. He's becoming a better and better hitter. 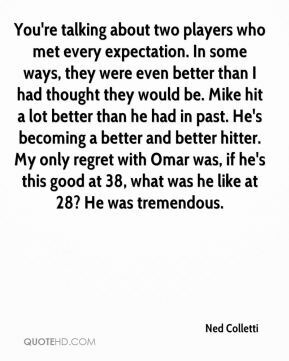 My only regret with Omar was, if he's this good at 38, what was he like at 28? He was tremendous. I went through a pretty intense experience. I met a lot of darkness inside and met it head on. 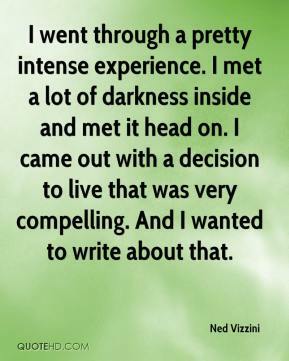 I came out with a decision to live that was very compelling. And I wanted to write about that. 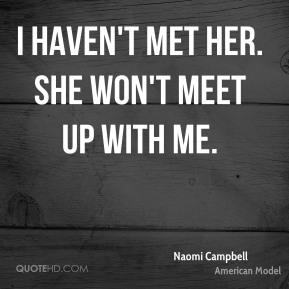 I haven't met her. She won't meet up with me. I've never met a better person. 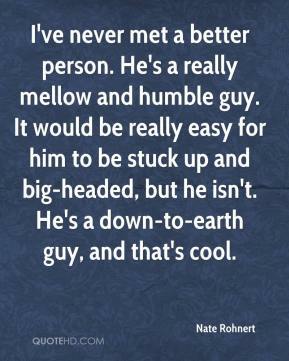 He's a really mellow and humble guy. It would be really easy for him to be stuck up and big-headed, but he isn't. He's a down-to-earth guy, and that's cool.